We highlight 16 final-year undergraduate and postgraduate shows that are open from 25 May 2018. The a-n Degree Shows Guide 2018 and online interactive map at www.a-n.co.uk/degree-shows provide listings for degree shows taking place throughout the UK. An exhibition of work from City of Glasgow’s BA (Hons) Contemporary Art Practice students. Includes painting, printmaking, photography, film, performance, sound, installation and more. There will also be a pop-up shop where artworks and curios will be available for purchase, plus talks by the exhibiting artists on their processes and concepts. 25 May – 1 June, Riverside Campus, 21 Thistle Street, Glasgow, G5 9XB. Celebrating its 10th anniversary, the John Lennon Art and Design Building is hosting new work by graduating students in areas including: Architecture, Fashion Design, Fashion Communication, Fine Art, Graphic Design and Illustration. The exhibition is titled ‘where do you see yourself 10 years from now?’, with the public asked to contribute their own answers via www.10yearsfromnow.co.uk. Responses are being exhibited during the show. 26 May – 8 June, John Lennon Art and Design Building, 2 Duckinfield Street, Liverpool, L3 5RD. Featuring work from Liverpool Hope University’s Fine and Applied Arts departments, this show includes drawing, painting, sculpture, installation, textiles, fine metals, print and ceramics. 26 May – 4 June, Hope Park, Liverpool, L16 9JD. Wrexham Glyndwr University’s broad-ranging degree show features work from various courses, including: Animation, Visual Effects & Games Art, Applied Arts, Film & Photography, Fine Art, Graphic Design & Multimedia, Illustration, Graphic Novels & Children’s Publishing. PV 25 May, 4-15 June, School of Creative Arts, Wrexham Glyndwr University, 49 Regent Street, Wrexham, LL11 1PF. Another bumper exhibition featuring work by students from a range of courses, including: Architectural Design and Technology, Artist Designer: Maker, Ceramics, Fine Art, Graphic Communication, Illustration, International Design, Photographic Practice, Product Design and Textiles. 26 May – 1 June, Llandaff Campus, Western Avenue, Cardiff, CF5 2YB. Graduating students from Canterbury Christ Church University’s art degree programme showcase their work in the Sidney Cooper gallery and painting studios. Work includes painting, printmaking, ceramics, sculpture, film, photography and digital art. 28 May – 11 June, North Holmes Road, Canterbury, CT1 1QU. This exhibition showcases work by artists and designers across Fashion, Fine Art, Graphic Design, Illustration, Textiles, Architecture, Film-making, Games Design, Journalism and Digital Media and Photography. 1-6 June, Brodrick Gallery, Hull School of Art & Design, Wilberforce Drive, Hull, HU1 3DG. 2018 marks 175 years of art and design education at Nottingham Trent University (NTU), which was established with the opening of the Nottingham Government School of Design in 1843. There’s a lot to see – this year’s show features the work of just over 1,300 graduates. PV 1 June, 2-10 June, 50 Shakespeare Street, Nottingham, NG1 4FQ. An exhibition of work by final-year students across various disciplines, including: FdA Art of Games Design; BA (Hons) Adventure Media, Digital Arts, Film & Television Production, Fine Art, Graphic Design, Illustration, Photography, Production, and Wildlife Media. 2-8 June, Fusehill Street, Carlisle, CA1 2HH. Glasgow School of Art’s annual undergraduate degree show features work from graduating students across the School of Design, School of Fine Art, Innovation School and the Mackintosh School of Architecture. Also running concurrently is the annual Master of Fine Art (MFA) Degree Show at The Glue Factory. 2-8 June, 167 Renfrew Street, Glasgow, G3 6RQ. 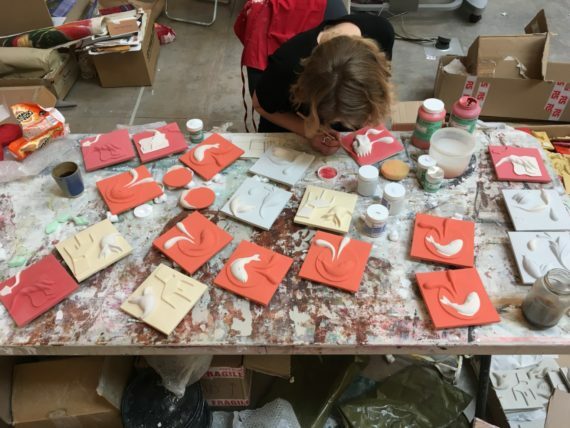 Over the course of nine days, Edinburgh College of Art will showcase the work of graduating students, the majority of whom are completing undergraduate degrees. This includes students from Art, Design, and ESALA (Edinburgh School of Architecture and Landscape Architecture). The show will conclude with a closing concert from the Scottish Chamber Orchestra in the Reid Concert Hall. 2-10 June, 74 Hunter Building, Lauriston Place, Edinburgh, EH3 9DF. For its degree show, the University of Brighton’s Grand Parade campus becomes a huge exhibition space, showcasing emerging talent from its arts, design, architecture and media students. PV 1 June, 2-10 June, 58–67 Grand Parade, BN2 0JY. Offering visitors an opportunity to experience a range of emerging contemporary art and design practices from its final-year students, the University of Derby’s degree show explores ‘the issues and subjects of today’s world’ whilst also looking ahead and ‘predicting and setting the trends of tomorrow’. 2-13 June, Kedleston Road, Derby, DE22 1GB. This show brings together the work of over 60 young artists at the culmination of four-year study on Newcastle University’s BA in Fine Art. The exhibition displays a diverse set of practices and media including painting, new media, film, video, sculpture, photography, print, sound, performance and installation. PV 1 June, 2-16 June, Northern Stage, Newcastle Upon Tyne, NE1 7RU. Featuring a variety of work from a range of courses, including Fine Art, Graphic Arts and Design and Architecture, this year’s Leeds Beckett University degree show – entitled ‘Beautiful Thinking’ – aims to ‘challenge the conventions of art and design practices and theories’. PV 1 June, 2-18 June, City Campus, Leeds, LS1 3HE. Kingston School of Art’s degree show features work from various courses, including: Graphic Design, Interior Design, Fashion, Graduate Diploma Creative Practice. PV 2 June, 3 – 8 June, Avionics building, Portland Road, KT1 2SH.